The old expression "the apple doesn't fall far from the tree" is especially relevant when it comes to the daughter of Gwyneth Paltrow and her ex-husband Chris Martin. Not only is her actual name Apple, but she's also a full-on mommy look alike who already appears to be following in her mother's footsteps in more ways than one. 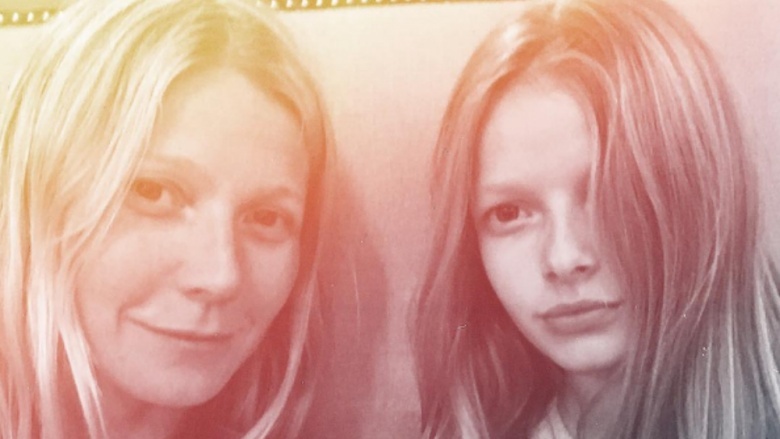 Here's why Apple Martin is basically already Paltrow's twin. Paltrow might have some physical similarities to her own mother Blythe Danner, but Apple is the absolute spitting image of her mom. The two share the same strikingly blue eyes, fair skin, and long, strawy tresses that they tend to messily part down the middle. What's more is they both have the same eyebrow lines, oval chin shape, steely no-nonsense expressions, and neither require a single drop of makeup to look perfect radiant and camera-ready at any given time. 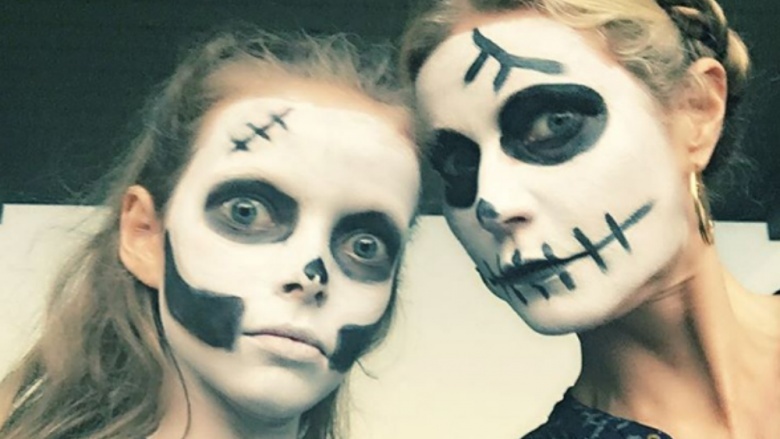 This is one mother-daughter pairing that won the DNA lottery twice over. Even though neither Gwyneth nor Apple need it—and in fact, Paltrow is frequently seen championing the makeup-free look on her Instagram feeds—they both still enjoy pampering themselves on occasion, including treating themselves to ritzy skin therapy facials together. In fact, at just 12, Apple has already become so adept in the cosmetics world that she's even been known to give her mother some product advice during her term as creative director for Juice Beauty. Per The New York Post, Paltrow recently bragged about the fact that her mini-me was "very concerned about [the brand] not having contouring kits" and suggested that the company add on some all-day lip kit options to its product line. Surprisingly, Apple's shade of choice is not the red that her name relates to, but she instead tends to favor the hot pink hues, as pre-teens tend to do. If there's one thing Apple Martin really seems to have in common with her other famous parent, Coldplay frontman Chris Martin, it's that she loves to sing and play the guitar in public. 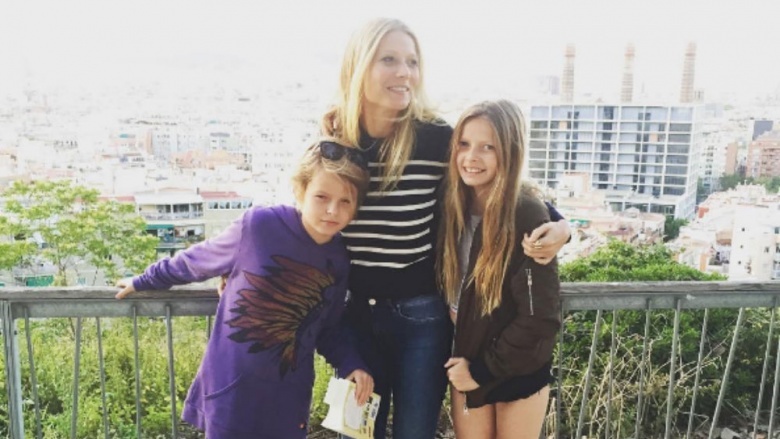 Paltrow shared a video of her daughter jamming on some holiday tunes with her kids choir in 2015, and even then it was abundantly clear how comfortable she was with performing live. 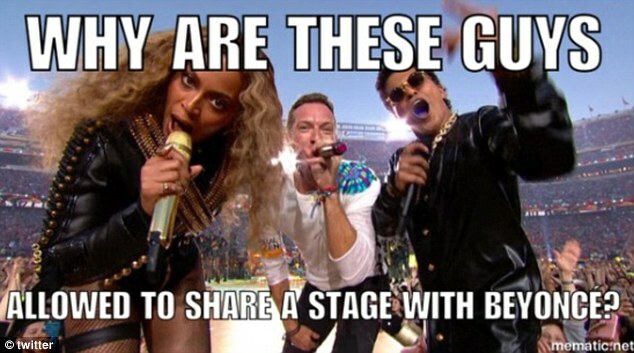 In 2016, she joined her little brother Moses and two cousins on the stage at one of her dad's concerts in Glastonbury, England, and guess who took the closest mic position of the group? Yep, Apple. This prime positioning gave the massive crowd a chance to hear Apple singing along with her dad on the band's song "Up & Up," and she wasn't one bit shy about showing off her sound. However, Danner believes her granddaughter might also follow in the family business on her maternal side as well. She told InTouch Weekly that even at a young age, Apple has already shown the kind of personality that's made for the red carpet lifestyle. "I definitely think she has that certain something. She's very funny and beautiful. She adores her mother, and I think she likes me, and I think she probably likes to follow in footsteps," she said of the then-five-year-old. "It's in their blood." Indeed, Paltrow is doing her part to prepare her for the glitz and glam of Hollywood and told People magazine that she's been saving all of her Oscars dresses—yes, including the pink one from the year she won Best Actress for Shakespeare in Love—so that Apple can one day wear them herself, if she likes. "Maybe she'll wear it to prom and do a Pretty in Pink thing and resew it and cut it up … I don't know if I'd let her chop that one up," she said. One of the most lasting appeals of Paltrow, apart from her good looks and on-camera skills of course, is the fact that she's always taken such a nonchalant approach to being a part of the fame game. Like Apple, she was born into it the biz thanks to her late director-producer father Bruce Paltrow and her esteemed actress mother Blythe Danner, so she earned a place among the stars very quickly and complacently early on in life. For her part, Apple appears to approach the attention with the same ease of attitude as her mom. 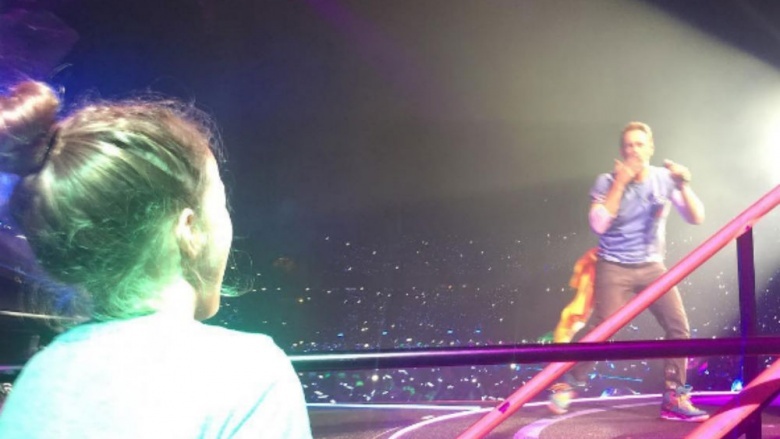 In fact, when Coldplay was preparing to headline the Super Bowl 50 Halftime Show, her dad said he got some sage words of wisdom from his little one, who told him (via CBS News), "Dad, the worst that could happen is you'll get turned into a meme. And after a month or so, people will just forget!" Oh, how prescient those words were. As the expression goes, "out of the mouths of babes." If there's one thing that Gwyneth Paltrow slyly boasts about on a regular occasion, it's how cool her collection of high-profile friends is. Just like her mom, Apple has gathered a pretty cool group of associates along the way as well. 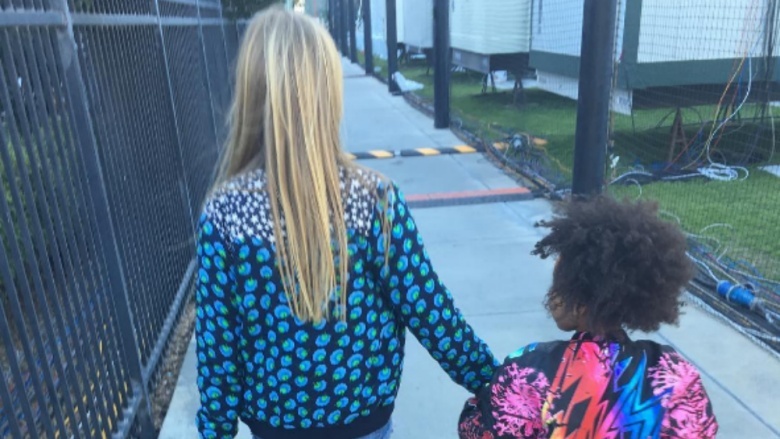 Not only is she enviably godsisters with the one and only Blue Ivy Carter—the daughter of Beyonce Knowles and Jay Z, of course—but she's also gotten to rub elbows with Taylor Swift, who Paltrow said she absolutely idolizes. Plus, her godfathers are actor Simon Pegg and Coldplay guitarist Jonny Buckland, so she's got friends in high places all over the world. Although Gwyneth and Apple are both close to their respective mothers, they also each seem to have a special affinity for the men in their lives. 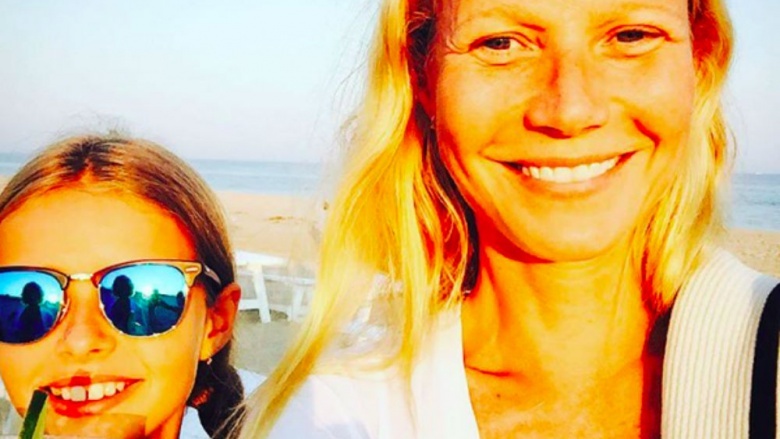 In Gwyneth's case, she regularly shares throwback photos of her father, who passed away in 2002, along with thoughtful comments about why she still respects and admires him so. 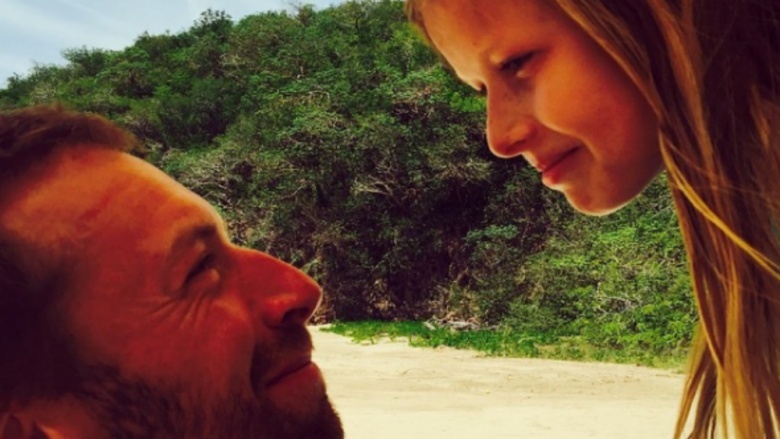 For example, on Father's Day in 2015, she shared a photo of herself with "Brucie," who could've been mistaken for Chris Martin in the image actually, and wrote, "A friend once said to me right after my father died, 'everyone has a father, but not everyone has a daddy'. Brucie, you were both. To say that I miss you is an understatement." Apple seems to share in that patriarchal regard department as well, as she's regularly captured sharing sweet moments with her own dad as they make the kind of memories that will last together, too. Paltrow has developed into something of a style icon over the years and even ran a lifestyle blog of her own called Goop. And Apple certainly seems to be inheriting her mother's sartorial self-esteem as she's regularly captured rocking her own funky fashion choices, like dinosaur-footed pajamas and a mermaid-finned swimsuit. One might safely imagine that if and when she does eventually make her red carpet debut, she'll be just as much of one to watch as her mom has been over the past few decades. 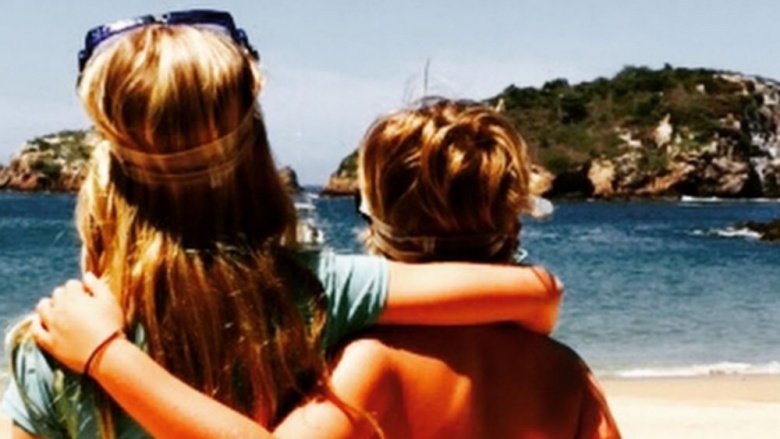 If there's one thing that Gwyneth Paltrow's divorce from Chris Martin taught the world, it's that they both share a family first mentality that cannot be shaken. The pair infamously announced their split by introducing the concept of "conscious uncoupling," which meant that they aimed to have the friendliest divorce known to man, and indeed, they've consistently maintained a supportive presence in one another's lives for the sake of their children. From watching Apple grow up in the fishbowl of fame by way of her mother's social media snaps, she also seems to have the same lovey dovey ethos her parents have expressed, as she tightly clings to her brother and is happy to show affection to her folks in any given shot of the family members together. The message coming off of the new generation, then, is that they're in this thing together, and it'll stay that way.